George W Bush and John Kerry have been making last-ditch attempts to win support on the final day of campaigning in the US presidential election. Both men spent Monday targeting key marginal states which could decide the battle for the White House, a race deemed too close to call. President Bush began his day at dawn, with rallies in Ohio, Pennsylvania, Wisconsin, Iowa and New Mexico. Senator Kerry campaigned in Florida, Wisconsin, Michigan and Ohio. With the latest opinion polls showing the two men neck-and-neck, both made last-minute appeals to Americans to make sure they cast their votes on Tuesday, hoping that a final turnout of undecided voters will work in their favour. The BBC's Justin Webb in Washington says neither candidate can be sure of a win, and the last day may be decisive. With the race so close, there are fears of a repeat of 2000's disputed result and subsequent legal wrangling. Already, two federal judges in the key state of Ohio have ruled that political party observers in polling stations may not challenge the credentials of voters during Tuesday's poll. One of the cases was brought by an African-American couple who argued that plans by President Bush's Republican Party to deploy such observers in mainly black areas amounted to intimidation. The Republicans say they should be able to challenge voters to prevent fraud, and have appealed against the ruling. Analysts believe the tight race in Ohio may prove the decider. Even a narrow majority would give the winner the state's entire set of 20 Electoral College votes that are used to pick the president. The victor there has won the White House in every vote since 1964 - and no Republican has ever won without it. 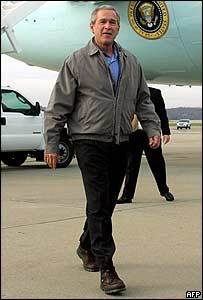 President Bush started the day in the state. A vote for his ticket, he told an early-morning crowd in Wilmington, was a vote for "a safer America and a stronger America and a better America". On his stop in Pittsburgh, Pennsylvania, he said he had "the finish line in sight" and in Milwaukee he promised a "brighter day and a more hopeful America for every citizen". The BBC's Stephen Evans, travelling with the incumbent president, says there is no certainty of victory within the Bush camp. One Republican strategist said he was both confident and anxious about the result. 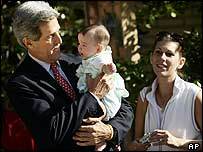 Senator Kerry started his day in Florida - the swing state narrowly won by Mr Bush in 2000 that gave him the election. The Democratic challenger told supporters it was time to "take this thing and finish it off and get the job done". The Democrats have 2,000 lawyers and tens of thousands of volunteers in Florida to monitor the vote after the controversial Republican victory there at the last election. Miami voters were crowding into polling stations on Monday to take advantage of the last day of early voting, amid fears that they would be overcrowded on election day itself. A record number of people have been voting early across the country, including nearly two million voters in Florida. Leaving the Florida sun for the rain and chill of Milwaukee, Mr Kerry and his team had to wait on arrival at General Mitchell International Airport as they crossed paths with Mr Bush. The BBC's Jill McGivering, with the Kerry campaign, said the challenger looked confident and relaxed as he told supporters in Wisconsin this was the most important election of their lives and urged them to get out and vote. He was finishing his campaign with a major rally in Cleveland, to be joined on stage by his family and rock star Bruce Springsteen. The candidates can campaign until midnight local time - which, in Washington DC, will be 0500 GMT. On election day itself, Mr Kerry will vote in Boston after starting the day in Wisconsin. Mr Bush's aides say he will vote in his home town of Crawford, Texas, before meeting campaign volunteers in Columbus, Ohio, and returning to the White House. Both camps were wrapping up their campaigns with a record number of last-minute advertisements. In the final hours of campaigning, they were less seeking new converts than trying to get all their supporters out on election day. "Get your friends and neighbours to go to the polls tomorrow," said Mr Bush in Wisconsin. "Knock on those doors, make those phone calls, help take friends to the polls."